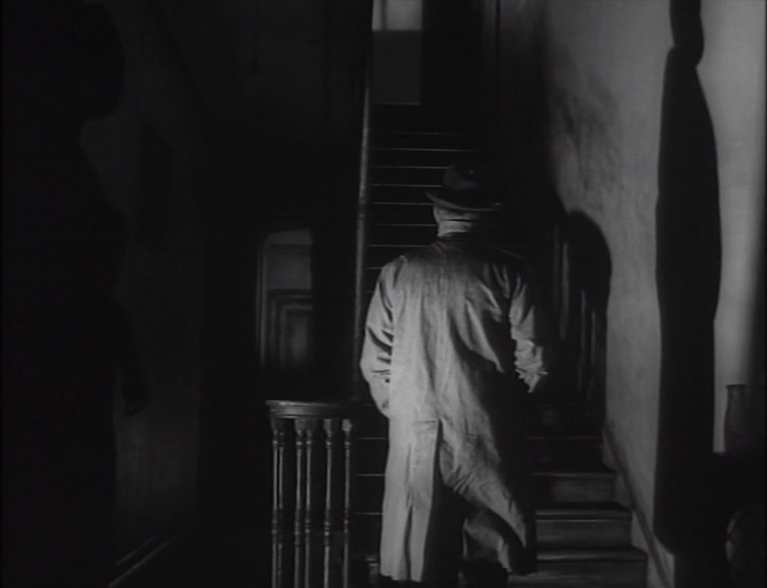 TAKE MY LIFE (1948) is Ronald Neame’s directorial debut. As you might expect if you know of Neame’s background as cinematographer for David Lean, the film is often very beautiful. And as you might expect if you’ve seen other Neame directorial jobs (eg GAMBIT, HOPSCOTCH), it’s a mildly diverting thriller — though of course he had other strengths (THE HORSE’S MOUTH, THE PRIME OF MISS JEAN BRODIE). What stops it from reaching the Hitchcockian heights it presumably aspires to (it’s a wrong-man thriller, after all) is perhaps a shortage of truly tense scenes, and a slightly dodgy structure, where it seems to be missing most of a second act. It’s based on a novel by Winston Grahame (MARNIE) and inventively folds its set-up into a summing-up by portly prosecutor Francis L. Sullivan with illustrative flashbacks, the last of which reveals that arrested man Hugh Williams is not the culprit — instead, joy of joys, we get Marius Goring, aged up with some grey streaks to his hair and face, as a Scottish schoolteacher secretly married to the victim. 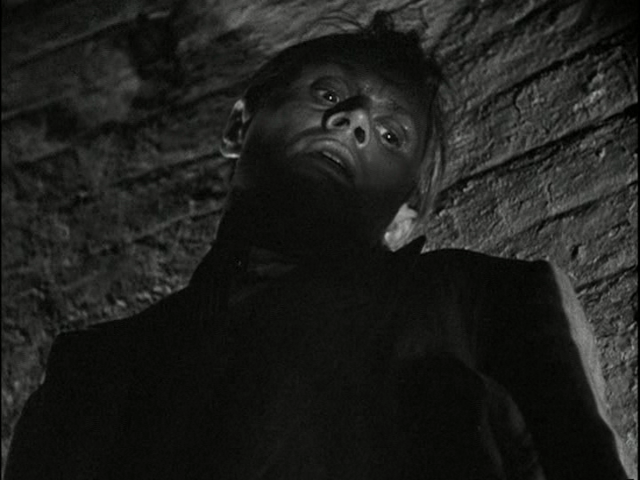 Now, Williams’ wife must investigate for herself, locating and somehow incriminating the sepulchral Scotsman. As lit by Guy Green, star Greta Gynt displays Norway’s most alluring complexion. 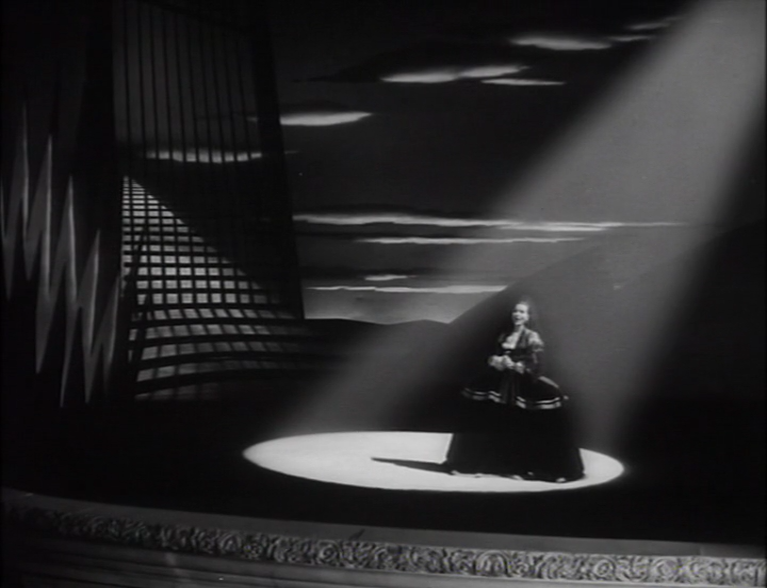 Her character’s career as opera singer allows for some nice visuals early on, and her artistic temperament ultimately triggers the circumstance that gets her husband incriminated (strict structuralism demands that this temperament return to play a role in the plot later, but it doesn’t). Hugh Williams, being imprisoned for much of the plot, can only look guilty — of what, we never know, since we know he’s not the murderer, but with his oiled beetle-shell of hair and somehow untrustworthy fleshy features, he is physiognomically incapable of projecting innocence. 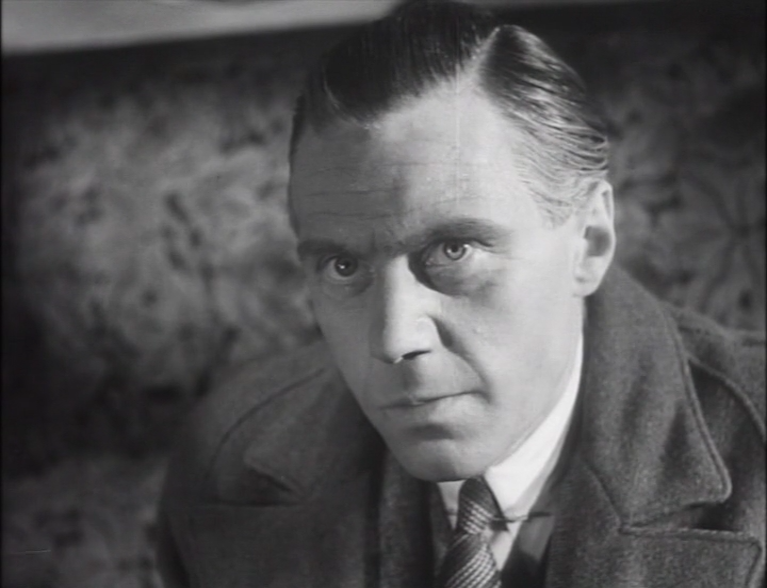 After the stylish and moody opening, the film has to rely on the threat to Williams to supply all dramatic tension, since Gynt’s efforts to clear his name do not put her in peril, do not give her problems she can struggle with, and rely on a wild and lucky coincidence to come to their resolution. Only when Goring is reintroduced and comes face to face with her can some proper suspense be created (Didn’t Goring ever play a vampire? He should’ve.) Apart from the ageing makeup, which looks fine in medium shot and goofy in close-up, he seems to have elongated the shape of his face, I think just by putting the tips of his teeth together rather than clenching them. At any rate, sometimes you can’t quite believe it’s him. The film’s other pleasant surprise is the darkly beautiful Rosalie Crutchley, whom I normally associate with her gloomy housekeeper role in Robert Wise’s THE HAUNTING. Here she gets to be a bit glam, and makes me wish she had gotten leading roles exploiting her slightly Latinate charms. An impossibility in the British film industry of the time, I fear. 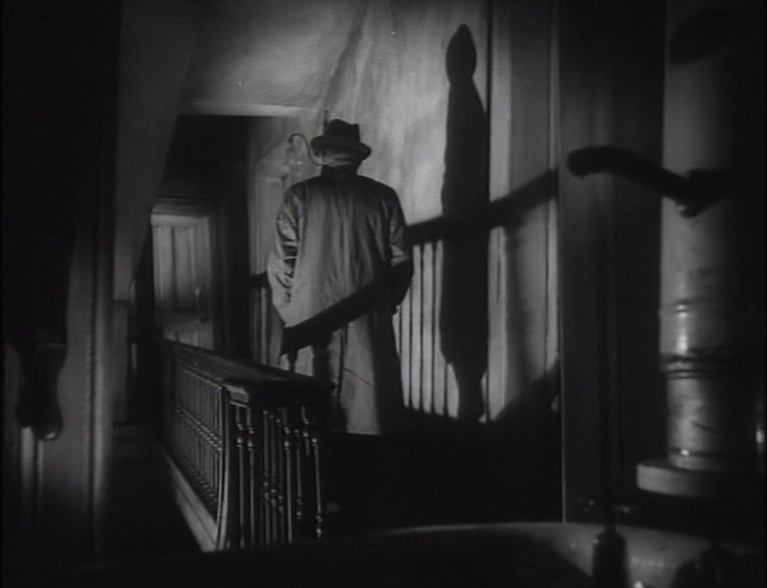 Had a great time showing NIGHT AND THE CITY to my class a couple weeks ago, a movie I always enjoy, for all kinds of things, from the London noir atmosphere, Francis Sullivan’s eloquently tortured fat man bad guy, and Richard Widmark’s sweaty desperation (ALL the characters in the film are studies in desperation of one kind or another). Despite the seedy atmosphere, the film seems to have had an oddly healthy effect on its participants, with Widmark and director Jules Dassin surviving well into their nineties, and co-star Googie Withers still being with us today. But this time I was taken with a minor player who was not so lucky. 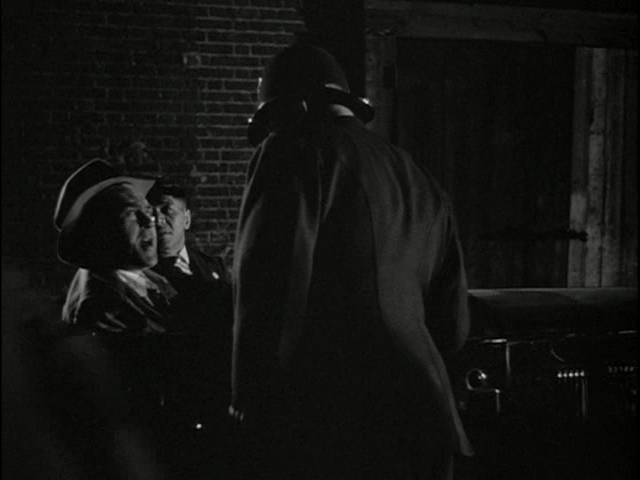 The thug in the car is an actor names Peter Butterworth. 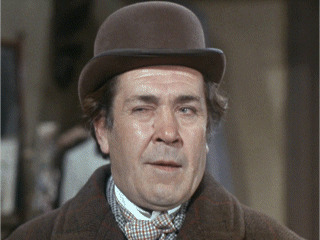 Not somebody one associates with thug parts, actually: Butterworth is chiefly known for his roles in the CARRY ON series, often as an incompetent underling to stars like Harry H Corbett (CARRY ON SCREAMING) or Kenneth Williams (DON’T LOSE YOUR HEAD). He’s also in three Richard Lester films, A FUNNY THING HAPPENED ON THE WAY TO THE FORUM, THE RITZ and ROBIN AND MARIAN, where he plays a barber-surgeon failing to extract an arrow from Richard Harris’s neck. Melancholy and an end-of-the-pier seediness seem to coalesce around the private lives of the CARRY ON team, few of who reached particularly ripe ages (so it’s pleasing to have Barbara Windsor as an uncharacteristically perky Dormouse in Tim Burton’s mess of an ALICE IN WONDERLAND). Butterworth’s death, aged sixty, from a heart attack while waiting in the wings to go onstage at a pantomime show (I’d previously read “while entertaining at a children’s party” but I’ll go with the IMDb), has a sad sound to it, although you can configure a Hollywood Version easily enough: the sound of laughter/applause ringing in his ears. And it probably beats being bashed with a brick, which is what happens to his co-thug in NIGHT AND THE CITY. Butterworth was a splendid comic, who could quietly hold his own amid the chaos of a CARRY ON farce — it was actually good from to upstage your fellow players in these things, since the only way to make the experience lively for the audience, with the inert staging, corny gags and clunking editing, was to have a few faces emoting at once, each trying to outdo the other in enthusiasm. Situate Butterworth in the background and he’d add a whole mini-drama just by being endearingly daft. He spends the whole climactic exposition of FORUM struggling to get his sword from its sheath, and faffs around behind Richard Harris in R&M, taking the curse off the script’s poetic musings with a welcome infusion of bumbling. Here’s a bit of SCREAMING which illustrates a number of the painful pleasures of that series. Fenella Fielding is a great underused resource of British cinema, best known internationally for revoicing Anita Pallenberg in BARBARELLA. Kenneth Williams, always alarming, is especially so as the reanimated Dr. Watt, his voice a-quiver with vibrato suggestiveness. Then, about three minutes or so in, we get Butterworth, who hardly says a word but stands behind the other players and mugs genially. Jim Dale tries to match him twitch for twitch, and you get a sort of doubling of affect as they do a kind of facial dance-off behind Harry H Corbett (once praised as British theatre’s answer to Brando, now a magnificently resourceful farceur with TV’s Steptoe and Son as, essentially, his entire career) and Williams. You can also appreciate Gerald Thomas’s bad filmmaking. He serves up passable angles in which we can enjoy the mugging, but they don’t cut together at all well — there’s no reason for the angle changes except to serve up a spurious variety to the coverage, and break the scene into manageable-sized segments. Kevin Smith must have been taking notes. Oh, and the big guy at the start is Bernard Bresslaw, who nearly got the role of the Creature in CURSE OF FRANKENSTEIN, just losing out to Christopher Lee. Imagine what a fun alternative universe that would be! I know, I know. Not great quality. 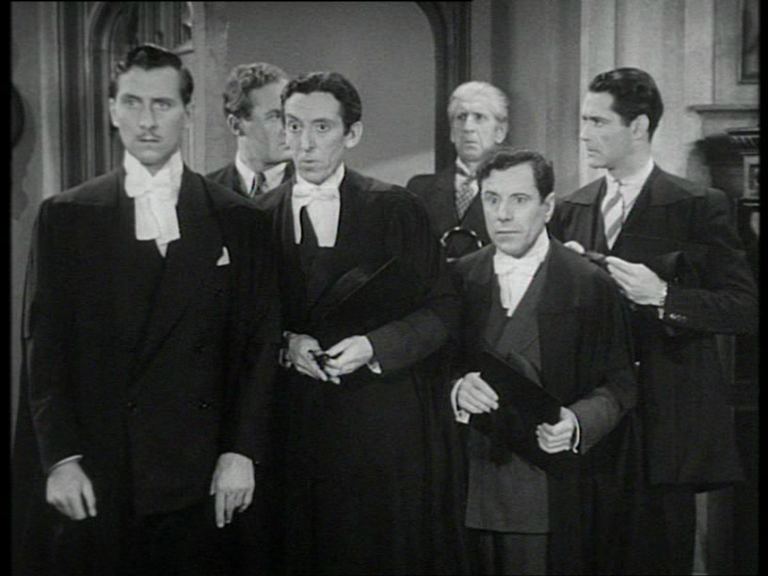 From THE WANDERING JEW (1933), directed by Maurice Elvey, who’s best known for THE CLAIRVOYANT (Claude Rains and Fay Wray) and a lively silent version of HINDLE WAKES, a much-filmed regional comedy. By the end of his career, Elvey had declined to slapstick comedies with Tommy Trinder. But THE WANDERING JEW is another kettle of fish and loaves. Conrad Veidt gives it his all as the titular semitic itinerant, in a tale which takes its starting point from the medieval yarn about the Jew cursed to walk the earth, immortal, until the Second Coming, his punishment for spitting on Christ. The story is obviously anti-semitic at heart, but the filmmakers try to turn things around and make Veidt an analogue for the suffering of the Jewish people. He is redeemed during the Spanish Inquisition (helmed by reliable fat baddie Francis L Sullivan, whose work here may have landed him a similar role of corpulent corruption in Sternberg’s abortive I, CLAUDIUS) where the film seems to be taking aim at the modern embodiments of prejudice and hatred. A pity they didn’t go all the way and bring the WJ into modern times, where he could denounce Hitler and Goebbels. But I guess in 1933 Britain was in a more… placatory mood. Of course, the implicit and explicit Christianity of the story kind of warps the pro-semitic good intentions, but you can see somebody meant well, meant to make a brave and powerful statement, and then just kind of got a bit lost. Anyway, the image above demonstrates Jesus cursing the WJ — we never see the Christ directly, and even his speech is represented by an intertitle, or, more correctly, a surtitle, which shrinks onto the screen until we can read it, or almost. 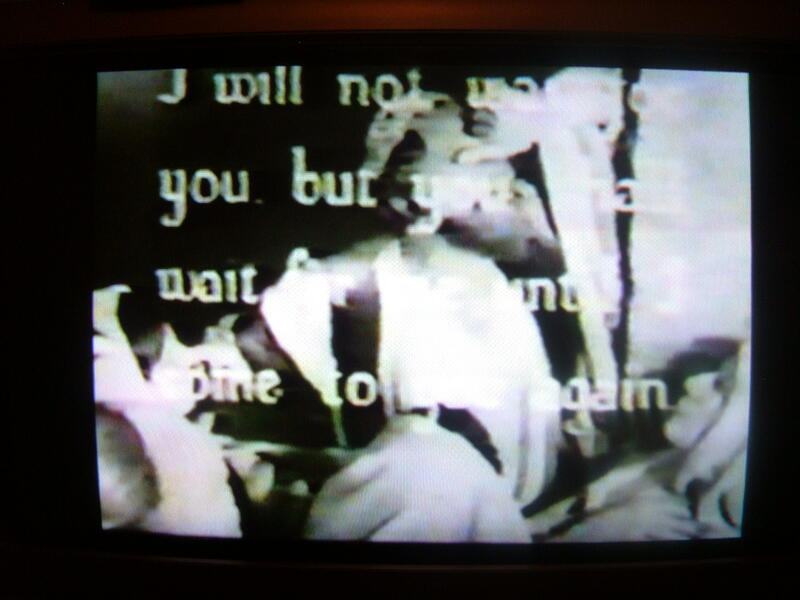 “I will not wait on you, but you shall wait for me until I come to you again.” Conrad then helpfully repeats the text for the benefit of any slow readers, and for those future generations viewing on a ratty copy with image so degraded you can hardly see anything. I like the idea that Jesus is so holy he can’t be seen directly by movie cameras (cf Wyler’s BEN HUR), and am even more impressed by the notion that his speech can only be represented through superimposed text. That’s some messiah! On the other hand, I am slightly surprised at the notion of Christ going around cursing people. That’s not how I imagined him, somehow. Elsewhere in the movie, Peggy Ashcroft is a young Spanish hottie, and Hugo Riesenfeld contributes a striking score — 30s British movies have their own very different musical sound — which, unfortunately, never seems to shut up for a minute.